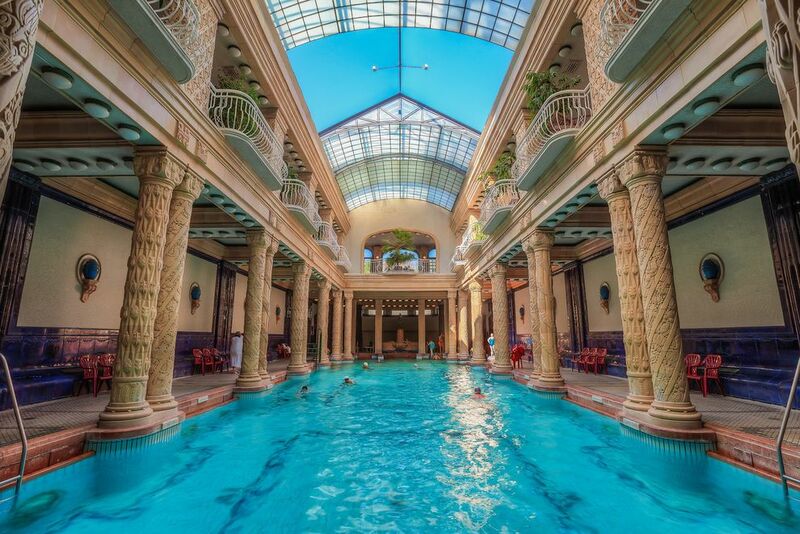 Hungary is extremely rich in natural hot spring water sources, so if you are visiting Budapest you probably want to try one of the plenty Turkish thermal baths. Most of them several have outdoor and indoor pools with different temperatures and activities as well as saunas and steam rooms, yet they all provide a different experience. Which thermal bath to visit in Budapest? We believe there is no general answer for that question, but this article should help you decide which one is the most suitable for your needs. These are our top picks to start with, in case you don’t find what you’re looking for, check the link in the end of the article. The gigantic Széchenyi Baths is one of the biggest thermal bath in Europe with its 21 pools ranging in temperature from 18 to 40 °C. Play chess with old Hungarians, go for a swim or massage, relax in one of the outdoor pools or try the sauna if it gets too cold. If you feel like staying for the night, check out the Spa Party schedule. Just a few bus stops from our apartments you can find the recently renovated Rudas Bath with an open-air rooftop pool providing an amazing view of the city, especially at night. Besides the numerous pools and saunas, the complex has its own restaurant where you can try Turkish and Hungarian fusional dishes.